Try to talk to people about getting their Seffner plumbing ready for winter and they usually just laugh. While it is true we generally have the most ideal weather a person could have for the winter months (compared to the rest of the country) it doesn’t mean we are completely exempt from it. We don’t get much winter but we do get cold fronts and the occasional freeze. The problem is that when that happens locals don’t know what to do. So that can lead to problems with plumbing because they are ill prepared. These are some steps you should practice each winter in preparation for the possibility of getting a cold spell even in this area. If it gets cold enough to need a jacket or sweater it probably means your plumbing could use some winterizing as well. Protect the pipes from freezing – Yes, pipes can and do burst here in the Sunshine state. While our freezing temps rarely last long it can be more than enough to cause problems with your pipes. This can cause major problems such as flooding inside your home. So why not eliminate the risk by taking the simple steps towards wrapping your un-insulated pipes with a blanket of foam? Take care of leaks – If you have any already existing leaks now is the best time to take care of them. Once cold weather moves in this will only make the problem worse. Make part of your winterizing routine to go around and check pipes and look for drips or puddles. Get rid of the exterior hose – Yes, we get to use the outdoor hose for much longer than the rest of the States, but there is still a period of time in the winter it goes unused. 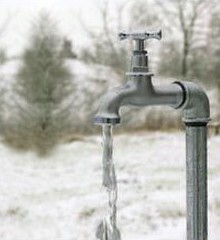 Leaving the hose attached during freezes can cause the water remaining to expand which can lead to freezing faucets and connecting pipes as well. Of course the best step to take is to simply contact one of our pros here at 1st Choice Plumbing Solutions to help advise you on how to winterize the plumbing of your Florida home. We can also take care of many of these tasks for you. So while we may not get much of a winter here it never hurts to be safe. Contact us today for the best in avoiding winter leaks through Seffner plumbing pro care. If you require the assistance of plumbing services in Seffner, please give us a call at 813-643-7556 or complete our online request form.